Population Health and those 'White Waters' of Health Reform | It's all about the triple aim. 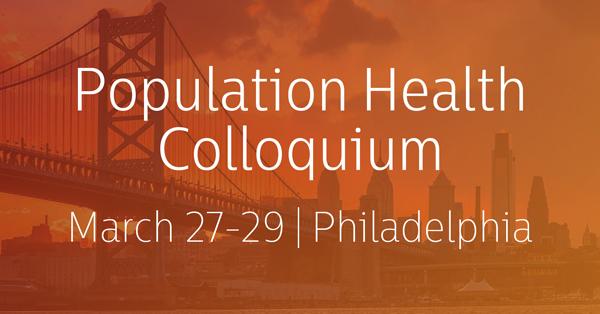 Amidst these shifting sands of health reform uncertainty, one of the ‘go-to’ conferences of the year to make sense of the likely vector of U.S. Health Policy is the Population Health Colloquium. The Colloquium runs from March 27th – 29th in the ‘City of Brotherly Love‘ Philadelphia. In its 17th year and masterfully curated and moderated by David Nash, MD, MBA the founding and current Dean of the College of Population Health at Jefferson University, the program brings together thought leaders, academics, practitioners and ‘best in class‘ operators in the population health industry. Covering the diverse population health ecosystem, the Colloquium will appeal to health system leadership, the payer community, clinicians, academics and both supplier and vendor stakeholder interests supporting the technology and infrastructure needs of an evolving industry and the networking opportunities may be unparalleled. The Colloquium hashtag is #pophealth17, and digital dashboard, here – where you can pull both transcripts and analytics (after free registration). The balance of keynotes can be found on the program Agenda. The range and the diversity of topics covered is impressive. For a representative sampling of interviews conducted at last year’s Colloquium, see: PHC 2016.